The concept and design for Next Generation ORCA (ngORCA) has not changed from when it was announced as ORCA2 in 2015 but we now know in greater detail how it will work. Specifications for Next Gen ORCA have been published on the project’s website for people who want to dive deep into the system. As the document is intended for the vendor that will implement and operate the system, it covers every aspect imaginable. I have selected a few notable features that will make you look forward to Next Gen ORCA when it launches in 2021. 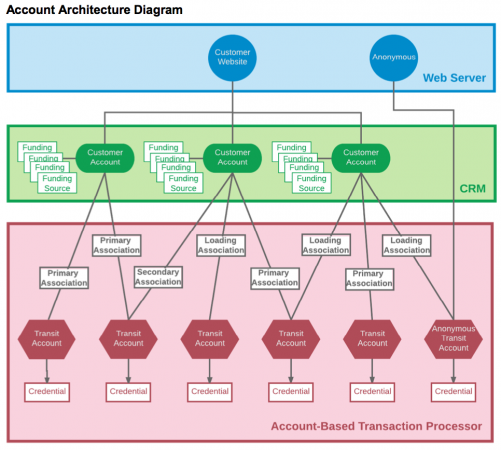 Next Gen ORCA is an accounts-based system. I explained what that means and how it differs from today’s ORCA in the ORCA2 post. The key feature of this change is eliminating the 24-hour delay between purchasing fare online and being able to use it. The delay is eliminated thanks to real time communication between validators in the field and your account in the backend. A transit account can be of any passenger type (adult, youth, senior, etc.). Like current cards, multiple fare products like stored value (e-purse) and passes can be loaded and used at the same time. 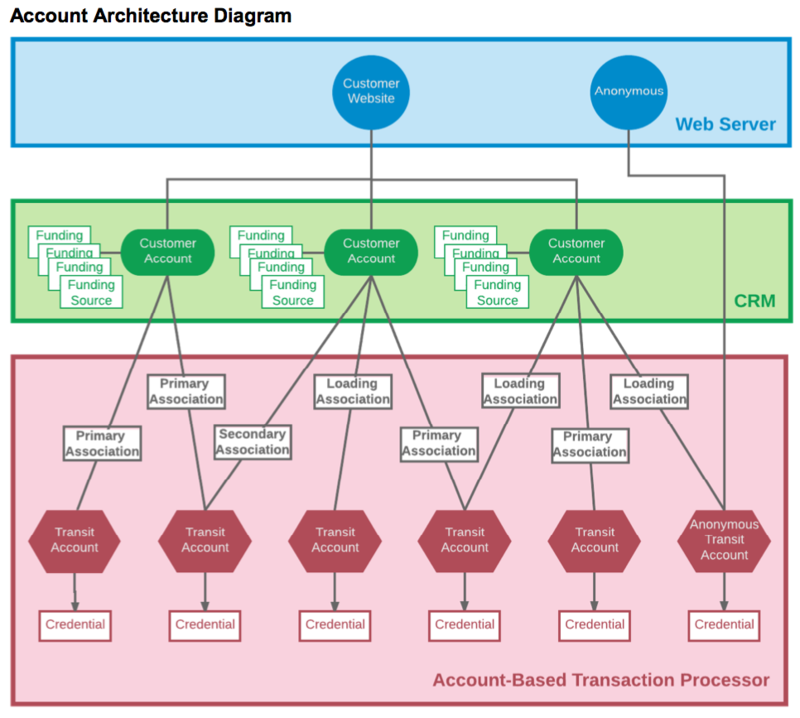 A transit account is automatically created when a credential is purchased or added to the system. At launch, classic ORCA cards, Next Gen ORCA cards, and NFC-capable devices with the ORCA mobile app can be used as a credential linked to a transit account. Third-party contactless cards and most open payment standards like Apple Pay will be accepted at a later phase. Only one credential can be associated to a transit account at a time. Transit accounts have the option of being associated with a customer account like those created on the ORCA website. Because everything is in a transit account and not a card, management should be much easier and more flexible than today. Transfering balances between two cards can be done in an instant. Lost cards can be replaced quicker. A family can have one account managing each member’s card with fares being paid from a shared purse. The ORCA mobile app for Android and iOS will allow customers with NFC-capable phones to skip buying a card altogether by using their phone as a “virtual card”. The mobile app can also convert a physical card into a mobile virtual card. An example of this feature can be seen with Suica card integration with Apple Pay in Japan. The mobile app will make it easy to get and reload cards on the go. Stored value can be used as full or partial payment for a pass, meaning no more unspendable quarters in your e-purse. Aside from cards provided for the initial launch by the system vendor, Next Gen ORCA cards will be procured through a competitive process. This should lower card costs by not locking agencies to the original vendor. These cards are designed for “extended use” (EU), meaning a durable, reusable card that lasts years as opposed to a “limited-use” disposable card. Limited-use cards will not be available at launch but are an option that may be used in the future. 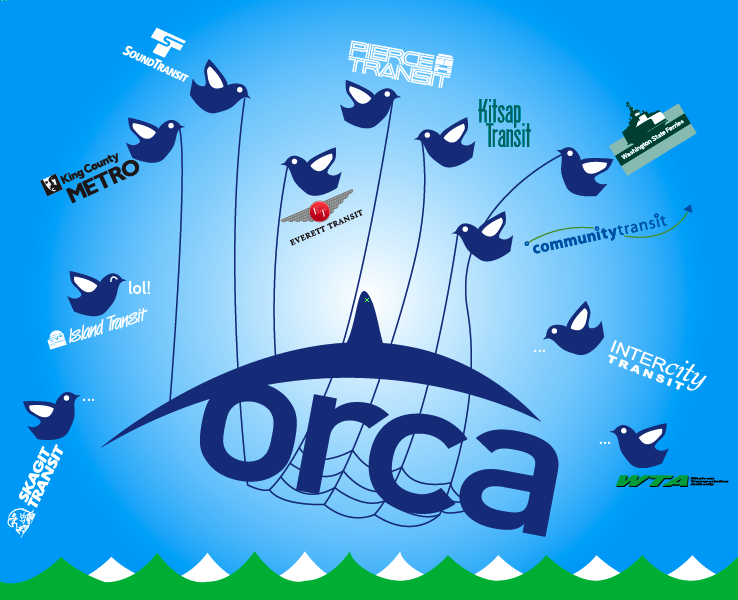 ORCA only has about 125 retailers spread across four counties. Next Gen ORCA’s retail network “will consist primarily of merchant locations that currently sell prepaid debit cards (e.g., gift cards)”. The goal is to have ORCA cards available in many more retailers than present and reach more people who do not have bank accounts. Portland’s recently launched Hop card has over 500 retailers in a much smaller area. 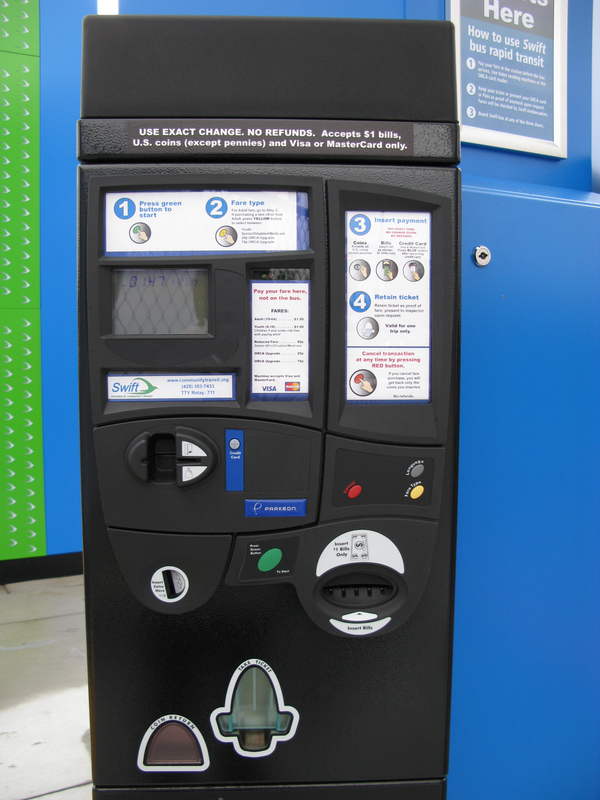 New onboard and wayside validators will replace obsolete readers on vehicles and at stations. Onboard validators will be installed at the front door of the bus and can be installed at rear doors should agencies choose to. When you tap your card on a validator, you should get a payment result within half a second (500 ms). That split second includes identifying your card, the round-trip to and from the backend for processing and receiving a response, and writing data back to the card. Validators communicate with the backend in real time over a wireless or wired network. Because communications can be unreliable in some places or times, the system can operate offline using data previously written to the card. Strategies will be developed to mitigate the risk of fraud. Validators will have bright full color displays capable of animation and can output audio tones including speech. 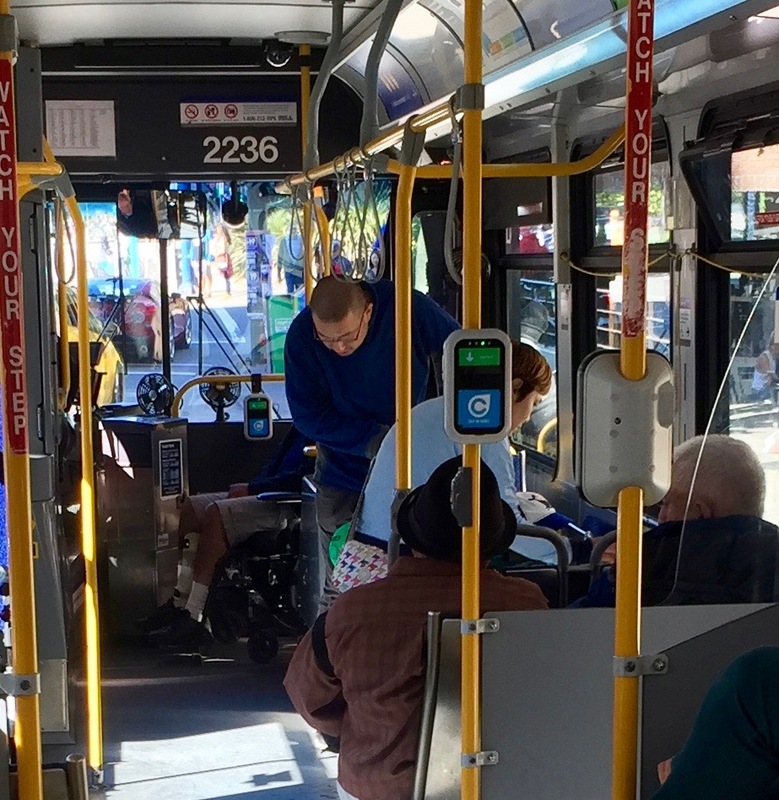 The specs call for “ADA-compliant visual and audible indicators that provide distinctive messages for approval or denial of all fare media validations and validator status. All validator visual and audio output will be fully configurable”. So implementing different sounds for tap-on, tap-off, cancelled trip, etc. should be possible. Although the mobile app will not support barcode-based payment, the validators have the capability to be upgraded with more memory and ancillary devices like a barcode scanner. What’s interesting about the onboard validator is that it will be location aware using the bus’s onboard systems. Raw GPS coordinates and stop ID are recorded with every fare transaction. This will provide planners with valuable stop-level boarding data to supplement existing data from passenger counters. There will be two types of vending machines. A Full Feature Vending Machine (FFVM) is similar in functionality to the current ticket vending machines. A new Light-feature Vending Machine (LFVM) will be available as a lower cost, smaller footprint option for agencies. Both types will allow customers to purchase and reload ORCA cards as well as paper tickets. Cash and credit cards are accepted for payment but the LFVM will not return change. Instead, any overpayment would be deposited as stored value to the card’s transit account or forfeited in the case of paper ticket purchases. Machines can be configured to offer the option of an “express” purchase which is a card with single-trip fare right from the home screen. I imagine LFVMs replacing the current parking-style ticket machines at streetcar and Swift stations. Those machines only dispense paper tickets and do not have ORCA functionality. Whether recent and future fare structure policy decisions will affect what is ultimately implemented remains to be seen. 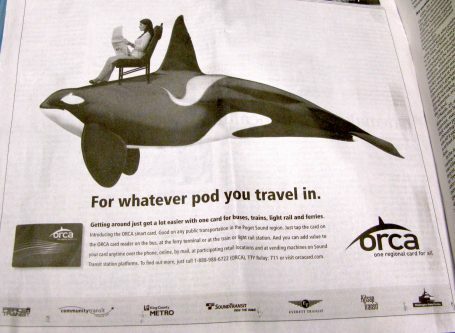 I already read conflicting statements that Next Gen ORCA will not support trip-based peak pricing. However, Metro’s move to a flat fare makes that an optional capability. It looks like the specs were written to cover all bases but it would be nice to have the ability to implement all sorts of fare products without additional development. The core system will launch in 2021-2022. The legacy ORCA system will be switched off in 2022 when the transition is complete. Phase II will then begin in 2023-2024. 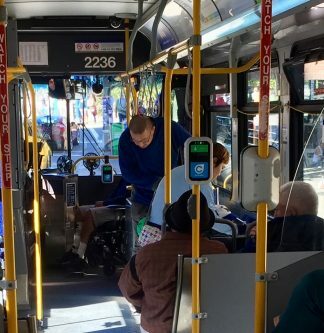 In this phase new projects such as “[Kitsap Fast Ferries] reservation system integration, expansion to other transit agencies, and further integration with both vanpool and Americans with Disabilities Act (ADA) paratransit [scheduling]” will be implemented. Will ORCA expand to other agencies in the next generation? There are too many capabilities to pick and list in one post so please share what you find interesting in the comments. Will the GPS recording extend to better arrival time info in OneBusAway? The next-gen wireless system will help that out. Right now, bandwidth limitations limit polling to about every 90 seconds (each vehicle on the street is polled once every 90 seconds or so). Rear door validators on ALL KCMetro buses, please. I’m just back from a long weekend in San Francisco; passenger loading is so much faster with card readers/validators at all doors. At least one of which is going to require a new executive director who isn’t opposed to sharing a bit of revenue with Seattle. I can’t say which one publicly but yeah… I’ve had some private discussions. 2023 gives me hope of a change of leadership in that agency by the right time so we can have some integration. Another of which is going to require having more routes not be fare-free in Island Transit. It’s already not “LOL” for their Everett-Camano connector. A distinct possibility since Island Transit gets a state grant no other transit agency in the state gets to operate a special pair of routes. What agency will write and administer policy? Who and what-all will be able to access my travel records without my consent? When using one of these cards loaded with a valid monthly pass, will I still be charged, and severely punished, for willful theft of service if I “tap on” in good faith after not “tapping off” by accident? I’m wondering about using a card to pay for multiple riders. It’s very annoying right now, would be nice if you could just tap the card twice. With the HOP card, they had a choice between fare caps and allowing multiple riders per card. They decided that fare capping was more popular than multiple riders per card, so implemented that instead. That could also be fixed in the driver’s computer interface. Multiple riders seems to be buried deep below several levels of menus, and the option is so infrequently used that most drivers need extra time to find and select it. Maybe the menu could be redesigned to make this option easier to find? Group payment on a single card will not be a feature in ngORCA. It gets complicated really quick. How do you specify multiple people at an offboard payment situation? How are transfers handled? How do you pay for people in different fare categories on a single card? Getting charged again for an accidental tap will annoy many people. And this doesn’t work for individual passes. Hopefully cards will be so cheap that won’t be necessary. And many people will be able to use their phone as a card. Right now you can do group payment by telling the driver how many people you’d like to pay for when riding the bus. I have a reduced payment through work and when I pay for 2, it charges the first at the reduced rate and the second at the regular rate. Those situations are hard for a physical card, but they’re trivial with a smartphone app. You’d just tell your app what you’re next tap is going to pay for while you’re waiting at the stop. Then it’s ready to go when your bus arrives. This seems like something that should be able to be done very easily in the upcoming mobile app. No longer would it be up to the driver to add more people to the charge on the card. The customer could make use of the time waiting for the bus to specify in the app which people are riding. Each person could also have an account without physical cards, and use the app exclusively. This is how it should be done. This is exactly the thing that seems to waste the most boarding time. And the exact thing an operator should most never be forced to do. The HOP card developed a network of vendors really quickly because the cards have both a magnetic strip and a RFID chip. The magnetic strip means the vendors can use a standard credit card reading machine to load money into the account. Does this mean I’ll be able to look in my account history and see the head sign for each tap? I can’t imagine any other use for this. Maybe they’re planning dynamic head signs that say something like “42 people are headed to Magnuson”? Or “You don’t even want this bus, it’s packed”? How about, “Congratulations Evan D on your 100th ride on Link!” ? No. That is for bus agencies without a computer aided dispatch/automatic vehicle location system. It is an alternative source for the route, trip and location information that’s sent to the backend when a fare is processed. While Metro isn’t planning for dynamic headsigns (that I know of), they are planning to push out passenger load information, potentially thru OBA. (Something like “seats available,” “standing room only,” and “crowded.”) That, combined with better arrival info, should improve the customer experience, or at least set expectations better. Well, the original post on NextGen Orca from 2015 estimated rollout in 2019. Now, rollout is estimated for 2021-22. So it appears that NextGen Orca actually goes into service 4 years from now, whenever now is. Integration with bikeshare would make a ton of sense. What does “barcode-based payment” mean? And the “specific trips” part of “time-of-day and day-of-week pricing (peak/off-peak fares), including for specific trips”? “Stand-alone configuration/change management system”? “Limited-use fare media”? Does “integration with other transportation connections” mean I can pay for Uber or a Spin bike or charge my non-existent electric car with ORCA? “barcode-based payment”: Think airplane boarding pass or Amtrak ticket or WSF ticket. Tickets are read using an optical barcode scanner instead of radio waves. “specific trips”: Currently peak fares on Metro work by designating specific trips as peak trips. You can see which trips are peak in the paper timetables. “Limited-use fare media”: Disposable smart tickets. For example, Muni has a limited use Clipper ticket for those not wanting to buy a Clipper card. They are limited in functionality and cannot be reloaded. “integration with other transportation connections”: yes, through APIs, third parties can integrate with ORCA. One thing that annoys me about our current system is that there is no way to know what time the transfer on your ORCA card will expire. This can make it a guessing game as to whether your tap will charge you for another fare. The expiration information is obviously there somewhere, but no way for the customer to know. It would be nice if they fixed this with the new version, and it seems like it should be a very simple thing to do. Speaking of card info, when you tap off of Link, the display tells you the balance remaining on your card. But when you tap on, it doesn’t give you that information. I’m unaware of any good reason for that, and changing it would be another easy fix. That’s what I like about ORCA’s sister system in San Francisco. When I tap my Clipper card on a Muni bus the display tells me how much time remaining on my transfer and my balance. It’s always two hours after you first pay. If you later pay a surcharge within that window, you get another two hours. So you just have to remember the last time you paid. Or get a pass and then you can mostly forget about it. I know you can track it yourself, but why should you have to if the info is on the card? Often I know roughly when I tapped, but more precise info is sometimes helpful. Any upcharge resets the 2 hour timer. Before ORCA, when you paid a fare upgrade with cash and your existing transfer you got a new paper transfer as if you paid full fare. That continued into ORCA and will continue to be the rule with Next Gen ORCA. A visitor from DC noticed that on and wrote a blog post about it. I’ve gotten six hours out a “single fare” once. Good to know. So what about a refunded upcharge? Example I take a 2.50 link ride. Then I get back on link. I pay another 50 cents. Does my window reset and point? And then I tap off, and my 50 cents are refunded. So they then also recoup my transfer time back to 2 hours from original trip start? Could Orca2 potentially allow businesses that validate parking for their customers to also validate transit fares? All too often, after validation, parking often becomes free, even in the middle of downtown, but transit, you have to pay. The last time I was there, the Portland Zoo offered admission discounts to people arriving by transit (which charging for parking), so there is some precedent. This is a great idea. I hope they consider it as a future project. Maybe if there was a business that would sponsor its development like the Downtown Seattle Association? Oregon Zoo still offers a $1.50 discount with a transit ticket or pass. Even so, the parking is frequently backup up onto the highway 26 exit ramp. I am low-income and do not qualify for the senior discount. I cannot afford a cell phone with data plan so I pay with e-purse or cash. Right now I can carefully plan my trips to store or doctor paying one fare and using the 2-hour transfer window to get myself back home on this single fare without paying twice. That really helps. I am concerned to think the upcoming price and method of payment structure may somehow disadvantage people in my situation, if the architects of the new plan design only around commuter usage. For instance, if the capped-day idea was designed to bias the collection of fares towards the front end of a given day in order to provide free bus service towards the end of the day, this seems to benefit those with long travel times and not those like me who make no more than one short trip per day. I am concerned that the transfer time may be reduced or eliminated which would exactly double my expense in taking the bus for the trips I make. Will the validators have an obvious visual indication when a scan is successful? The current ones beep, but if someone has just tapped in before you, the green light barely flickers and the display might not change at all. For the hearing impaired (…or those of us wearing headphones…) it’s really hard to tell if the card has been scanned. One of those dumb UI issues that would be trivial fix, and yet it’s been this way for years.